HOFFMAN ESTATES, Ill. — Eight University of Iowa wrestlers advanced to the semifinals in the Ken Kraft Midlands Championships on Saturday night inside Sears Centre Arena, placing the Hawkeyes at the top of the team race after day one. Spencer Lee got the ball rolling in the second session with a technical fall in 2:23 as the top seed at 125 pounds to advance to the semifinals. No. 2 Austin DeSanto added bonus points with a 13-3 major decision and Paul Glynn earned a 4-0 decision as both advanced to the semifinals of the 133-pound bracket. No. 2 Max Murin and No.2 Cash Wilcke both picked up decisions to advance to the semifinals in the 141 and 184-pound brackets. Fifth-seeded Pat Lugo advanced due to an injury default at 149. With over three minutes of riding time, No. 2 Kaleb Young recorded his third technical fall of the tournament to move onto the semifinal round in the 157-pound bracket. In the 165-pound bracket, No. 2 Alex Marinelli won, 8-6, in sudden victory one to advance to the semifinals,where he will face the No. 3 seed, Joshua Shields (Arizona State). 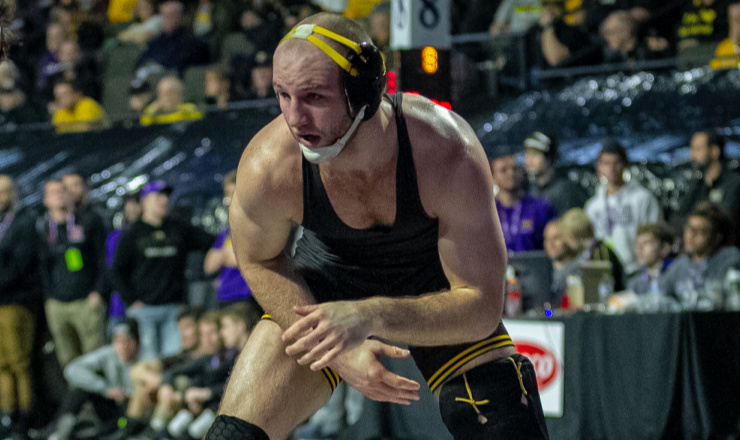 Vince Turk, Jacob Warner, and Tony Cassioppi fell to the back side of the bracket where there are five Hawkeyes vying for a spot in the third-place match. Four Hawkeyes were eliminated during the second round. Competition resumes with Session III tomorrow at 12 p.m. (CT). The Midlands Championships is streamed online at BTN2Go and at FloWrestling.com. Live results are available at TrackWrestling.com. The tournament in broadcast on AM 800 KXIC and stream on hawkeyesports.com via Hawkeye All-Access.